Products die, but brands can live forever. Like a product, brand have a life cycle on it’s own, but it does not necessarily related to the product’s life cycle. Lina Bivainiene discussed how brand life cycle differs from product life cycle. Though the life cycle status of a product may influence it’s brand power, brands go beyond the availability of the product itself. A brands’s life is measured by it’s ability to gain space in it’s customer’s mind, deeply related to it’s brand image. As long as that space existed in a person’s mind, a brand is alive. Summarizing that logic, Kapferer explained that a brand is not a product. Brands start from one product, but it can continue to grow into multiple products. That is the main reason why some brands can live on without having products, while some others can be considered dead. It depends on whether it was managed attached to a single product, or rather being expanded by associated with other products. The one that makes a clear distinction of brands and products are their life cycle. The concept of brand life is firstly described as the distinguishing of separate stages in which a brand is introduced to the market, the sales of products (marked with brand) are increasing and later decreasing. In the last stage, a brand may be related to other products. When discussing brand life cycle, we must firsthand identify it’s product life cycle. A product life cycle is mainly consisted of four stages—introduction, growth, maturity, and declining stage. It determines a product’s long-time profitability based on it’s market penetration and distribution. Using this as a basis, Bivainiene identified brand life cycle according to it’s product’s life cycle and how they condition differ in each stages. The first stage, introduction, is marked by the launch of a new product in the market. The sales volume and income for the product are increasing, while the brand is new and unknown. The company performs communication and information communication so that the brand can establish itself and enter the next stage—growth stage. In the growth stage, more customers recognize the product and are developing their consumption habits of it. The sales volumes stabilize and start decreasing. In this stage, the brand is already known but customers are yet to develop their brand loyalty. The next stage is maturity, when the sale of a product stabilizes and start decreasing. Usually, in this stage, new products with similar selling propositions appear on the market while the market level is constantly expanding. Brands in this stage have achieved their previous goal to build long-time relationships with their customers. The last stage of a product life cycle is the declining stage. The sales of the product is constantly decreasing. Most companies tend to stop the production process before it’s brand image fall too far. The companies which have the intention to produce the products again in the future need to take measures in this stage by seeking loyal customers and maintaining their attachments to the brand. If this stage can be surpassed, then a brand can reposition itself in the market. Time factor is important in defining a brand’s life. The amount of time a brand has in developing itself generally matches it’s development process, though some may not develop as fast as others. Bivainiene identified brand life cycle derived from product life cycle model and related it with the aspects of brand identity prism. In this case, the prism identity may be understood as the basis for a brand life as the principles of relations, values, and coherence being integrated link the six main elements (physical, appearance, personality, relations, culture, reflection of consumer, consumer’s self-image. Idris Moore take a different approach on brand life cycle. 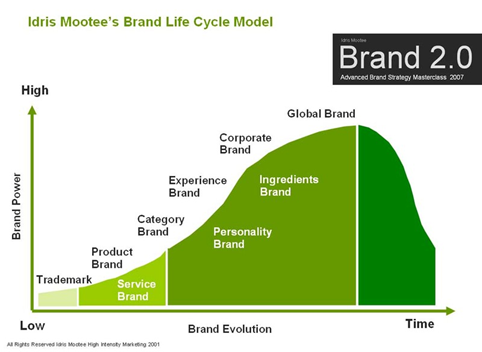 Moore identified how a brand can grow from one single product into brands that are known globally and develop a brand life cycle to measure brand’s power. Bennett, R., & Rundle-Thiele, S. (2005). The Brand Loyalty Lfe Cycle: Implications for Marketeers. Journal of Brand Management, Vol. 12, No. 4, 250–263. Bivainiene, L. (2010). Brand Life Cycle: Theoretical Discourse. Journal of Economics and Management, Vol. 15, 408-415. Kapferer, J.-N. (2012). The New Strategic Brand Management: Advanced Insights and Strategic Thinking (Fifth Edition). London: Kogan Page. Liebermann, Y. (1986). Advertising to Sales Ratio along the Brand Life Cycle: a Critical Review. Journal of Managerial and Decision Economics, Vol. 7, 43-48. Liu, X., & Li, W. (2014). an Analysis of Brand Triangle Model for Product Life Cycle. Journal of Applied Mechanics and Materials, 1645-1649. Polinder, H. C. (2016). The Moderating Effect of Brand Life on The Impact of Electronic Word-of-Mouth Valence on Brand Love (Thesis). Enschede: University of Twente. 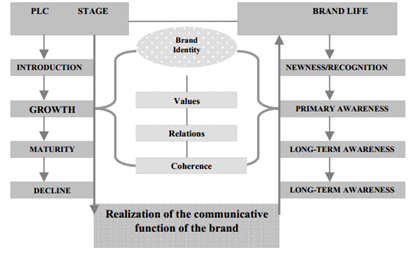 Lina Bivainiene, “Brand Life Cycle: Theoritical Discourses”, Journal of Economics and Management, Vol. 15, (2010), pg. 408. Jean-Noel Kapferer, The New Strategic Brand Management: Advanced Insights and Strategic Thinking, (London: Kogan Page, 2012), pg. 214. H. C. Polinder, The Moderating Effect of Brand Life on the Impact of Electronic Word-of-Mouth Valence on Brand Love (Thesis), (Enschede: University of Twente), pg. 13. Lina Bivainiene, Op.Cit., pg. 410. Idris Mootee, “Understanding the Brand Life Cycle Model” in http://idr.is/understanding-t/, accessed March 16 2016.